As the fantasy world clamors for Sam Dyson and Pedro Strop to scoop some extra saves, we will be different. Sure, these two may be in line for the occasional save opportunity, Strop until Brandon Morrow returns from his back injury and Dyson until Mark Melancon proves more durability, but both situations are temporary. 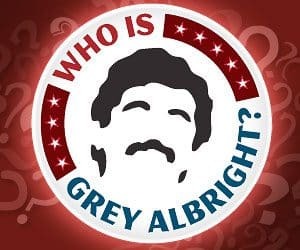 There are some names available that could bring long-term help to your fantasy roster. This week I am headed to the waiver wire to see if Joe Jimenez (FAAB Bid: 5%) or Jordan Hicks (FAAB Bid: 5%) are still around. Both of these relievers have found themselves sneaking into save chances. Jimenez and Hicks provide upside that Dyson and Strop do not. They can potentially provide saves for the rest of the season with a strikeout ability unmatched by most relievers on the wire. Joe Jimenez is known for having an elite fastball that sets the table for a devastating breaker. This year the stuff is working better than ever. His K-BB% is currently 22.6%, and is showing control like he never has before. Putting this command together with his swing-and-miss stuff is deadly for opposing hitters. It’s slightly unbelievable that he has flown so far under the radar this season. The Tigers relief arm has had hype in the past, but while finally performing in 2018 no one is talking about him due to the lack of excitement surrounding Detroit baseball. This season he has improved his spin rate on the fastball and slider. Overall he is generating more pop-ups, swing-and-misses, and has improved nearly every aspect of his game. If he is still available on your wire, jump on the opportunity to grab more saves in the future. Jimenez has picked up 2 in June and possesses the most talent in their bullpen. 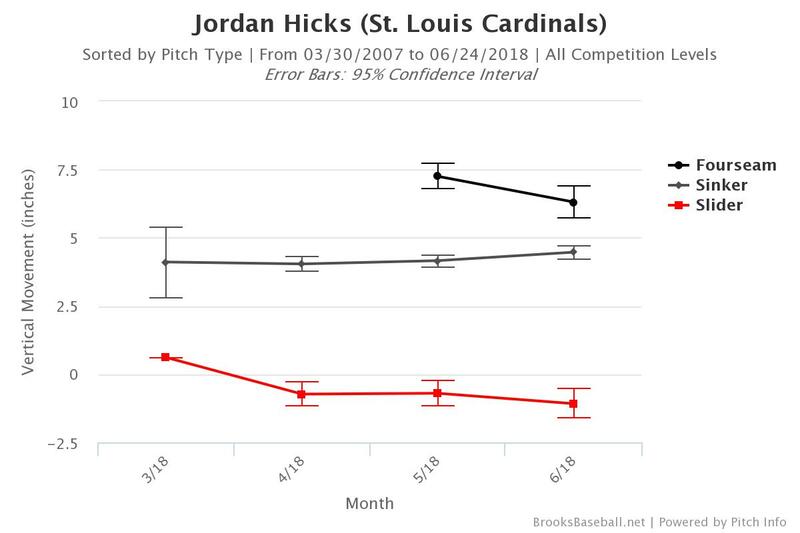 Jordan Hicks has no problem generating hype. 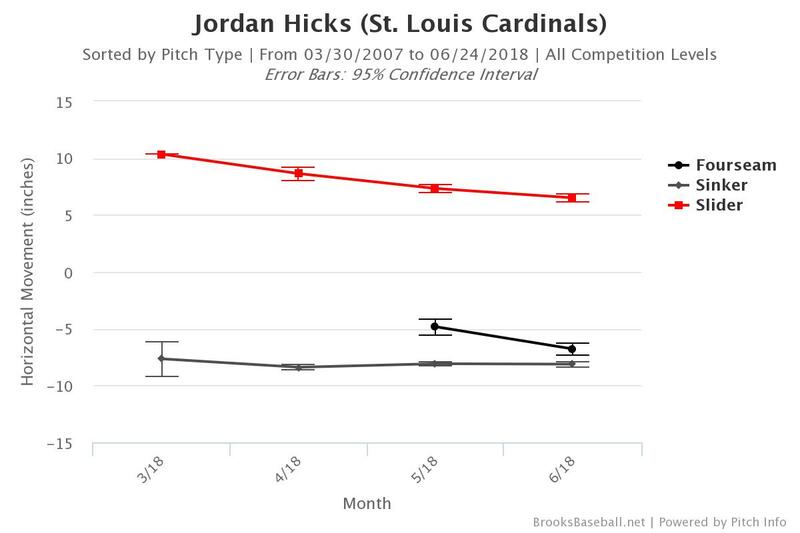 Owned in quite a few leagues based on the fact that he throws unleaded gas, Hicks is now picking up occasional saves. The 21-year-old is averaging 99.9 MPH on the heater this season and has recently discovered a slider to neutralize the opposition. He has only been barreled up twice all year, proving that, despite a high BB% and low K%, Hicks is incredibly hard to hit. His slider has transformed this season, and as the movement improves on that offering, his SwStr% and K% flourish. Hicks is a pitcher built for Twitter. He has gaudy velocity statistics, extreme sinking action on the fastball, and delivery with intent. This is genuinely one of the most exciting pitchers in the game today, and you should own him NOW. The Mets left-hander is another pitcher that is performing to low-level of hype. Based on his pedigree, Southpaw velocity, new coaching staff, and youth it is shocking to see him going under the radar. Matz is pitching to a 3.68 ERA, after a poor start in Coors, and continues to outpitch his peripherals. The underrating of this New York arm must be due to a high BB%, resulting in a subpar WHIP. However, I think people don’t want to buy into Matz due to being burned in the past. He brought the curveball back to life this season, generating more whiffs than ever. This improvement came after a career low in curveball whiff% last season. That curveball was a deadly pitch to both sides of the plate, but 2017 saw a drop from 22% whiff% to 11.3% whiff%. Matz raised this back up to 25.8% this season to match his other offerings which are all above 24%, except the sinker. If Matz is available in your league, be a buyer. The worst that can happen is you drop him due to injuries that mar his career to this point. The best case scenario is he becomes the pitcher we always thought he would be and help your fantasy team for the rest of the season. If you’re in need of the perfect utility player for your bench, or an injury replacement, Matt Duffy is your man. The multi-positional threat is, simply put, a great hitter. 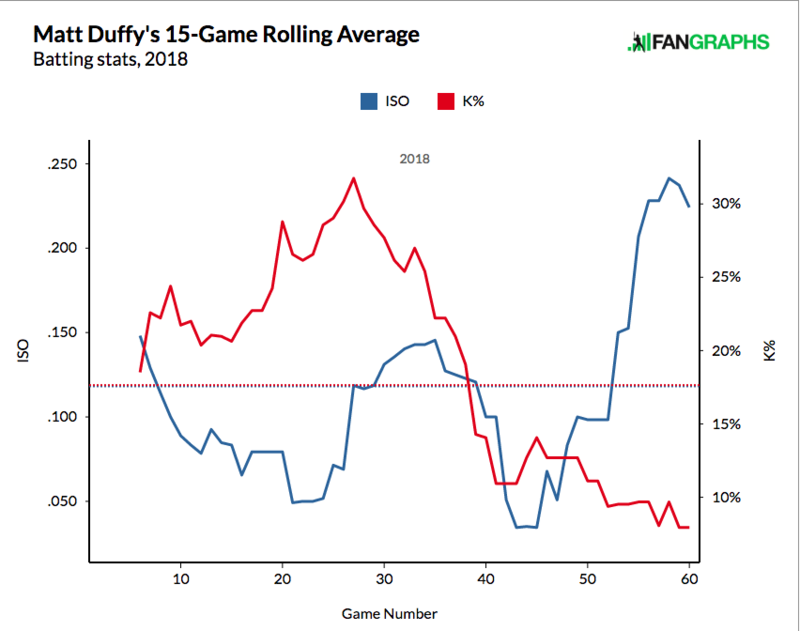 After missing an entire season and a half, Duffy is back on track. He is swinging more than ever and making just as much contact, which peaks my intrigue. Duffy is a player who missed a ton of time, came back and picked up right where he left off. More recently, his ISO is rising, K% is falling, and his fantasy performances are improving. It is time to get him on rosters for his consistency and upside. The power and speed have not been as apparent as they once were, but the tools are still there. He has 2 HR and 2 SB this month alone and is making the most of his contact. Get Matt Duffy on your team before he goes on a real tear. On the opposite side of the “Matt Duffy contact%” spectrum sits Randal Grichuk. After a rough start to the season, and a reboot in the minors, Grichuk is doing Grichuk things again. “Grichuk things” means that he is absolutely mashing baseballs. His hard hit% is higher than ever, his barrel% is back up to 16% and 16th on the overall leaderboards, plus his K% has come down since returning. All of these statistics make Grichuk a decent bet to continue his current hot streak through the summer. Any fantasy roster in need of some power should be putting more money on this outfielder. There are only a handful of names that can bring the same power potential off the waiver wire. Time to give the slugger another chance in 2018 and pick him up before he hits too many more homers. His price is already inflated because of his recent performances, but still cheap due to his ice-cold start, demotion, and consistently underperforming his pedigree. Due to the improvements, in June, this could be the time that he finally plays up to that power and potential. Would you rank Yates about Hicks and Jimenez as far as priority of owning? All three are still out there. I will likely pick up two. @Molina Bros BBQ: Jimenez — Hicks — Yates. I do like Yates, but the other two are already picking up saves and have more upside. Saves, holds H2H league. One owner has 6 RPs and needs to trade a few. He has Soria, Norris, Familia, Knebel, Rodney and Davis. My starters are terrific but I need bullpen help. While chasing saves and holds with Parker, BearClaw, Britton, Herrera and one from the list above, I want to avoid implosions (leery of Davis in Coors?). Playoff weeks can be unraveled with a ninth inning disaster crushing WHIP and ERA . Please rank these for relative safety as well as reasonable expectations for saves. (Is Norris vulnerable given your comments above? @5 and 2/3 Innings: I think Norris is vulnerable because A. He’s Bud Norris, and B. Jordan Hicks is phenomenal. Knebel, Davis, and Rodney aren’t going anywhere, so if you want to, call them the safest (that’s also how I’d rank them.) Familia, Soria, Norris are meh… I think Familia is safe too. I usually don’t trade for saves/holds so past those rankings I would recommend just holding off and trying to scoop something off the wire.